The Camogie Association, in conjunction with The National Dairy Council, are pleased to announce that registration for the Hurl with Me programme is now open. 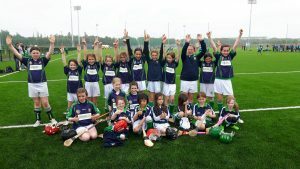 This programme is aimed at 7-10 year olds and their parents/guardians in camogie clubs across the country. To register go to www.camogie.ie or our social media platforms and follow the link. Over a four-week period, one night a week, parents will train alongside their daughter under the watchful eye of an experienced coach. The aim is to give parents the opportunity to learn the basic skills of the game in a fun and supportive environment. Skills can then be practiced at home with their daughter – increasing physical activity levels for both parent and child. Longer term, this may well be the first step in a parent becoming more involved in the club through coaching or an officer role. The programme culminates in a National Hurl with Me Day which will take place in the GAA National Games Development Centre, Abbottstown, Dublin on June 25th. Registration closes on Thursday 27th April at 4pm. Get registering now!